SOUTHERN LIBYA, May 17 2013 (IPS) - Kaltoum Saleh, 18, is elated to graduate from her overcrowded high school in the remote Saharan town of Ubari, near the Algerian border. Saleh, a member of Ubari’s indigenous Tebu tribe, says that for decades under former Libyan dictator Muammar Gaddafi, the Libyan Tebu suffered from state-sanctioned discrimination, which stemmed in part from the failure of the semi-nomadic tribe to register under Libya’s 1954 citizenship law. Gaddafi’s subsequent “Arabisation” campaign, intended to erase indigenous language and culture, also contributed to discrimination against the Tebu, many of whom were deprived of citizenship papers. As a result, they were barred from decent health care, education and skilled jobs. They often worked for low pay or as subsistence cross-border smugglers. The tribe was swift to join the revolution against the regime in 2011, and with Gaddafi’s overthrow, the Tebu hoped to attain what they had long been struggling for: their full rights as citizens. More than two years after the revolution, Saleh proudly says that her father, once a security guard, is now a hospital manager. She herself has considerable ambitions and is striving to become a human rights lawyer and fight for Tebu rights. But the revolution has not produced all the gains the Libyan Tebu have sought. They lack sufficient representation in the Tripoli-based government, are in conflict with neighbouring Arab tribes, partly over resources in the current power vacuum, and are still branded by some Libyans as ‘foreigners’. In their quest for equal rights, Libya’s Tebu are now positioning themselves as valuable and natural guardians of the country’s vast southern borders. Stretched across Libya’s south, the Tebu live in Ubari, Sebha and Murzuq in the west, and across the Sahara nearly 1,000 kilometres to the Kufra oasis in the east. The desert terrain, with no roads across its width, is rich in underground water – which is diverted to ninety percent of Libya’s population along the coast – as well as oil and precious minerals. It is also a haven for illegal cross-border trade, with weapons, government-subsidised gasoline and food smuggled out, and migrants and drugs transported in. At the beginning of the revolt in 2011, Gaddafi promised both the indigenous Libyan Tebu and Tuareg citizenship papers and rights in exchange for their support. While the Tuareg threw their lot in with his regime, only to find themselves on the losing side, the Tebu say they instead took Gaddafi’s weapons, and turned them and their desert expertise against him. 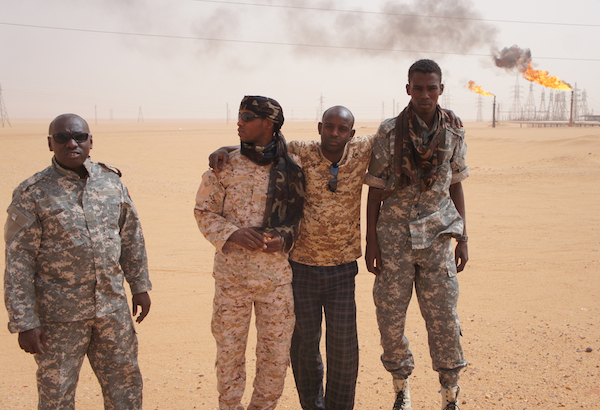 Although the Tebu were heralded for their revolutionary role guarding Libya’s southern borders and oil wells, with just two Tebu representatives out of 200 in the current General National Congress (GNC), their fight for equal rights is just gearing up. "The Tebu want to close the chapter so they can get their citizenship, healthcare and education." In 2012, brutal clashes erupted between Tebu and Arab tribes in the desert towns of Sebha and Kufra. Mostly over power and resources, including smuggling routes, the fighting left hundreds dead and wounded, destroyed infrastructure and deepened animosity between neighbours. Now an enormous wall and wide ditch encircles Kufra, built and controlled by the Arab Zwai tribe, who share the town with the minority Tebu. A tense ceasefire – not peace – is in place. There is more optimism in Sebha. Last month, community elders successfully hammered out a reconciliation agreement between the western town’s Tebu and Arab Awlad Suleiman tribes. “The Tebu want to close the chapter so they can get their citizenship, healthcare and education,” said Mohammed Sidi, one of the chief negotiators. Ubari, over 100 kilometres west of Sebha, is the last in a chain of fertile desert oases surrounded by sand dunes before the Algerian border. Dominated by the semi-nomadic Libyan Tuareg, who are also indigenous and have strong cross-border ties, this desolate corner thrived as a tourist destination until the 2011 revolution. Now Ubari is known as a stop on the rumoured smuggling routes south to Mali and for its lucrative oil fields. It is also where Saif al-Islam Gaddafi, a son of Muammar Gaddafi, was apprehended while trying to flee Libya after the fall of Tripoli. The Tebu, along with Tuareg and Arab militias, maintain an uneasy presence here, legitimised and paid for as part of the Ministry of Defence’s auxiliary Shield of Libya brigades and by private oil field security companies. For now, they are the border guard presence. While the Tebu loosely patrol the southern border from Niger to Egypt, the Tuareg control Libya’s far southwest corner and the Algerian frontier running north to Ghadames. The war in Mali, the terrorist attack against the nearby Amenas oil field in Algeria, the French Embassy bombing in Tripoli and rumours of Islamists trafficking weapons and fighters south have heightened community tensions. Concerned about Libya’s porous frontier, the European Union and countries including the United States and United Kingdom are providing “advisory” roles in building up the government’s border guard. The U.S. Africa Command (AFRICOM) has established a military base for drones on the south side of the Libyan border, in Niger. Chaotic downtown Ubari is filled with migrants, most from Mali and Niger, who congregate on damaged sidewalks hoping for work, while Tuareg and Tebu tribesmen, wrapped in elaborate scarves to shield themselves from the dust, drive by in honking Toyota pickups. Chieftains work hard to maintain the peace in mixed Libyan Tebu and Tuareg communities, like Ubari. They understand their shared battle is to overcome discrimination from Libya’s Arab population and to secure their rights. revelation indelibly imprinted on the global consciousness by the brutes’ own cell phones. residents of nearby Tawurgha – before disposing of the bodies in an unknown location.